Max Muscle Sports Nutrition franchise business opportunity. Free Max Muscle Sports Nutrition business franchise information. A leader in the sports nutrition industry since 1991, Max Muscle® produces and distributes its own line of popular high-quality sports nutrition supplements as well as a complete line of workout and casual wear for today's active consumer. Max Muscle products are marketed through the company's national network of stores, as well as through a broader distribution base world-wide. The Max Muscle brand has earned a reputation for producing and selling superior and reliable quality products within the sports nutrition industry. Max Muscle is indeed one such company. This franchised business system has demonstrated that it is "a company whose time has come". It is VERY well positioned to become THE dominant commercial force in sports nutrition, weight loss, and all around general fitness. It has a game plan for the future, and THE GOOD NEWS is that this company is willing to share its future with its franchisees. And, the company is "on its way up", so it is a great time to study it. All three offerings are rewarding and tailored to a person's situation and dream. And, EACH offering has its own set of qualifying requirements. This last option permits the owner to build his/her own "Max Muscle empire" throughout a large metropolitan area or even a state. By approaching your exploration of Max Muscle together, we will assist you with what to look for in a successful franchise, and you can share with us what you are seeking personally, financially, and professionally. Max Muscle customers come from all walks of life and include men, women, young adults, everyday fitness enthusiasts, and bodybuilders. The one thing that all our customers have in common - and something that keeps them coming back to Max Muscle stores- is they appreciate our employees' reputation for providing a high level of service and knowledge. As a franchise owner, we'll keep you abreast of the latest product and technology developments, so you can keep your customers informed. Our popular MaxFormation Fitness Quest is another way we motivate and educate our customers to reach and sometimes surpass their fitness and weight loss goals. We've also received accolades for Max Sports and Fitness, our popular monthly magazine designed to educate and keep customers - and potential customers - informed. Thanks to the magazine's reputation for informative articles, expert advice and celebrity/pro athlete interviews, distribution of Max Sports and Fitness has increase to almost 100,000 per month. Then flex your Entrepreneurial Muscle - We'll spot! If you're thinking about becoming a franchise owner, you're probably already drawn to the idea of being in business for yourself, but not by yourself. 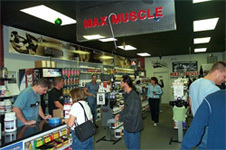 At Max Muscle, we give you the respect and freedom you deserve as a business owner, while still providing you with the support, guidelines and resources you need to run your own Max Muscle store. At Max Muscle, we value our employees and franchise owners and understand that our success depends on your success. We make it even less intimidating by offering a comprehensive initial training program for you and your store manager at our company's California headquarters. To learn more about the Max Muscle Sports Nutrition franchise opportunity simply complete the form below.